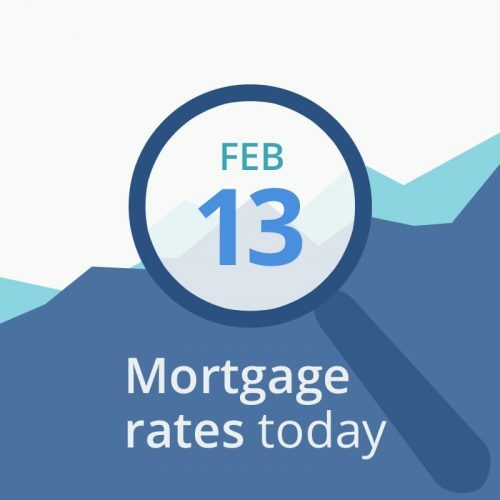 Average mortgage rates today are mostly unchanged. This morning, we received the week’s first major economic report — January’s Consumer Price Index. This key inflation report showed less inflation than expected, which is slightly good for mortgage rates. Experts predicted a .1 percent increase, and the more important Core CPI to increase .2 percent. Instead, we got no increase in overall inflation, while the Core rate, which leaves out volatile food and energy prices, rose as expected, .2 percent. And this is why rates barely budged this morning. Today’s financial data are mostly neutral-to-negative for mortgage rates. News of a signed deal to end the possibility of a government shutdown could push markets and mortgage rates up, should it occur. CNNMoney’s Fear & Greed Index remains at 68 (out of a possible 100), solidly in “greed.” That is neutral for borrowers because there was no change. However,“greedy” investors push bond prices down (and interest rates up) as they leave the bond market and move into stocks, while “fearful” investors do the opposite. So lower readings are better than higher ones. The decision to lock or float is complicated when rates seem stuck or moving aimlessly. However, in the short-term, the trend has been upward. Homebuyers with higher debt-to-income ratios should be more inclined to lock, because higher rates could kill their mortgage approval. If you’re refinancing, that’s less critical and you may be able to gamble and float.